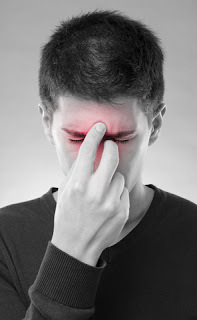 For patients suffering from chronic sinusitis, the problem may lay more with the absence of "good" bacteria in the sinus cavities than "bad" bacteria that needs to be eliminated. A study in 2012 documented what normal bacteria colonization should be found in healthy sinus cavities versus those suffering from chronic sinusitis. The study evaluated (only) 10 healthy patients and 10 suffering from chronic sinusitis. Within this small study population, they found over 1482 different species of "germs" were found in LOWER abundances in patients suffering from chronic sinusitis compared to healthy sinuses. Yes... germs are found in healthy sinuses, but compared to diseased sinuses, there is a more abundant AND diverse composition of germs in normal sinus cavities. In particular, probiotic species Lactobacillus sakei was found to be particularly reduced in chronic sinusitis patients. Other species also reduced in chronic sinusitis patients included Carnobacterium alterfunditum, Enterococcus mundtii, and Pediococcus pentosaceus. Corynebacterium tuberculostearicum was the only bacteria found significantly increased in diseased sinus cavities compared to healthy sinus cavities. Other studies have supported the decreased biodiversity and abundance of microbes in chronic sinusitis though the compositions are somewhat different between studies. Based on these results, several research teams (UCSF and Baylor) are trying to determine the right cocktail of probiotics to add to nasal rinses that can be performed to help replenish the microbiotia of diseased sinus cavities back into a healthier (normal) composition. Unlike the benefit found for the stomach and intestines, it has already been determined that oral intake of probiotics is NOT effective in the treatment of diseased sinuses [link] which is why focus is more towards nasal rinse applications. Of course, that has not stopped some laypeople from doing their own research on themselves, most notably Lacto Bacto which documents alleged successful chronic sinusitis treatment by applying spicy fermented cabbage (Korean kimchi) to the nose. Hopefully, in the next few years, research will provide commercially available effective probiotic sinus rinse treatments. Sinus microbiome diversity depletion and Corynebacterium tuberculostearicum enrichment mediates rhino sinusitis. Sci Transl Med. 2012 Sep 12;4(151):151ra124. doi: 10.1126/scitranslmed.3003783. Sinus microbiota varies among chronic rhinosinusitis phenotypes and predicts surgical outcome. J Allergy Clin Immunol. 2015 Aug;136(2):334-42.e1. doi: 10.1016/j.jaci.2015.02.008. Epub 2015 Mar 26. Decreased diversity of nasal microbiota and their secreted extracellular vesicles in patients with chronic rhinosinusitis based on a metagenomic analysis. Allergy. 2014 Apr;69(4):517-26. I read your post with interest, and especially mention of my site Lacto Bacto. I just want to report that for the past 3 years people have been writing in from all over the world (publicly and privately) telling me their experiences with various products containing Lactobacillus sakei (the original beneficial bacteria that treated sinusitis in the Abreu et al 2012 study). Most people report success. Kimchi may contain Lactobacillus sakei at certain times during fermentation - which is why it was so successful in treating my family almost 4 years ago. Unfortunately the L. sakei doesn't stick around after treatment, which is why we and others have to treat again if (when) we develop sinusitis again, e.g. after a cold.